The Cognition series of adventure games had a bit of a rocky start with its first two episodes. Rough beginnings with The Hangman led into an improved experience with the second episode, The Wise Monkey. Now, a few months after the last release, the third entry is finally out. Erica Reed’s story continues in The Oracle, and while the overall experience is very similar, the story is definitely heating up. 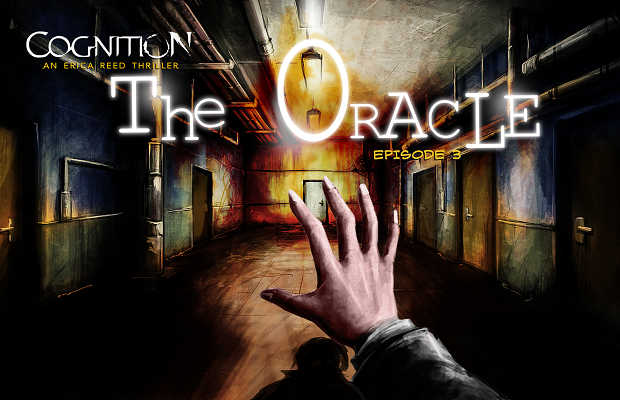 Picking up after the bloody final events of The Wise Monkey, The Oracle begins to reveal key players in the season-wide plot. Opening scenes see Erica investigating the death of a previous suspect, after he mysteriously falls from high atop the Enthon Towers, an extravagant building filled to the brim with penthouse suites and financial bigwigs. Those in charge attempt to quickly cover up any signs of foul play, and it’s up to Reed to figure out what happened, and more importantly, how it relates to the recent string of murders. This premise itself communicates the major shift within The Oracle. Gone is the map of Boston used to traverse a multitude of locales, and in its stead are a series of extensive visions brought on by Reed’s psychic powers. The Oracle favors a much more personal story which focuses mainly on Reed and her internal dialogue, as the number of people you interact with can be counted on one hand. Her visions, however, bring about a Day of the Tentacle-style system which has the player jumping between various events in the past. For fear of spoilers, I won’t go into specifics, but there are quite a few major revelations. These simultaneous timelines are unfortunately also the source of my main gripe with the game. At its best, The Oracle is seamlessly layering up to four different events on top of each other, all of which provide context and clues for the others. Reed uses her psychic powers to see events in the past to help her investigation, as well as make sure key events play out as they’re supposed to. That being said, the interplay between these different events isn’t always perfect. More than once I found myself confused as to when a certain event was happening. Hints would be dropped and goals given, but it wasn’t always clear when these clues would be utilized. More than once I deduced the solution to a puzzle, only to beat my head against a wall because I wasn’t supposed to solve it yet, or I hadn’t revealed enough of a past timeline to do so. None of this ruined the experience by any means, but these instances caused the kind of frustration only a point-and-click adventure can. The budget nature of the character animations is still fully present, but at this point in the series is becoming much more of an afterthought. Some great voice acting really hammers home more emotional scenes, which at this point in its progression really matters. I’m finding myself much more forgiving of these faults, mostly because of my growing investment in the overall plot. As I’ve explained in reviews of the first two episodes, the story is nothing groundbreaking, but that in no way means it’s bad. As the end of The Oracle approached, I found myself truly engaged within the happenings of Erica Reed. Despite the gameplay justifications for the episode, Phoenix Online Studios is spending more time focusing on character development than dwelling on the supernatural aspects. At its core, The Oracle is about cashing in on previous attachment to known characters while introducing a few more, all in favor of setting up the final episode. The season of Cognition will end with episode four, The Cain Killer, and I’m much more invested than I imagined I would be during my first few hours with the series. I’m genuinely interested to see what the studio does in the future. While The Oracle does suffer from many of the same faults as the previous episodes, if you’ve stuck around this long, you probably don’t care. Sure it’s budget and it shows, sure there’s the occasional technical hiccup, but the story is delivering on enough points to keep me interested.